The Aspire Cleito is a Sub-Ohm tank that is more than the sum of its parts. It has an all new atomizer design that replaces the standard chimney similar to a cartomizer which allows the atomizer head to deliver maximized airflow and vapor production. 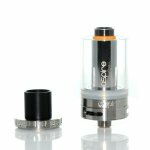 The Cleito Coil features a clapton styled coil that features full organic cotton in two configurations, with a 0.2 ohm coil that has a range of 55 to 70W and a 0.4 ohm coil that has a range of 40 to 60W. 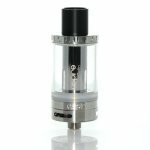 The full length coil structure also allows for the compact form factor to hold 3.5ml of liquid capacity while also implementing an easy top fill system. Dual adjustable airflow measures 9mm by 2mm each air slot, allowing for ample airflow. Product Includes: (1) Aspire Cleito Sub-Ohm Tank, (1) 0.4 ohm clapton coil, (1) 0.2 ohm clapton coil, (1) additional glass tank section (1) Set of Cleito tank bands.